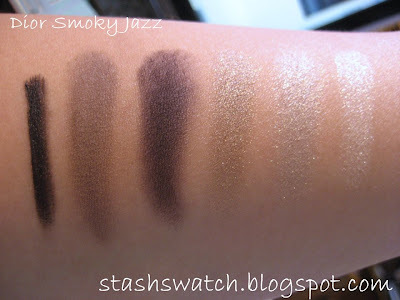 Smoky Jazz is a cute little palette with 4 e/s, a brow powder, and a cream eyeliner. It comes with a double ended floam applicator and a double ended brush with an angled brush on one end and a thin smudge brush on the other. 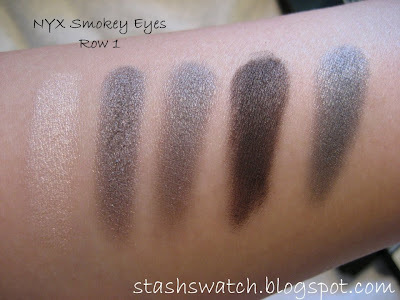 At first glance, I feel that this palette doesn't really look very smokey, but trying this on my eyes, I was pleasantly surprised to find that it works very well as a smokey palette. The plastic insert in the palette calls the white shade a "Topcoat" This color is a pretty shimmering white which can be applied to be an opaque, glittering white, or sheered out over the lid to have a nice shimmer. This is a great hightlight color and makes a passable base color as well. The next color over is a shimmery taupey silver. The color next to that is a warmer taupe. 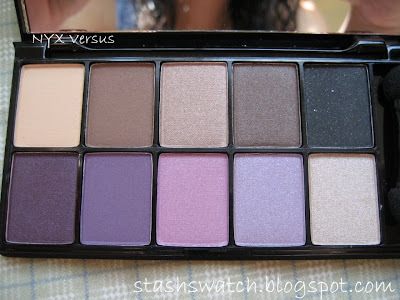 The last e/s shade in the palette is a really pretty matte taupey purple grey. I like this color the best probably out of the colors in this palette, but it definitely seems a bit out of place. The taupe color next to the black liner is labeled as a brow powder by the plastic insert. It looks too light to be of any use as a brow powder for ladies with black hair, however, when I gave it a try on a whim while I was playing with the palette, it worked surprisingly well for me. I guess it's good to know that in a pinch I can get away with using this as a brow filler. It also works just fine as an eyeshadow. The cream eyeliner is a basic black eyeliner. It applies just fine, but never fully sets like gel liners do (remains smudgeable). It does last an awfully long time though..it took me 2 days to get this one off my arm. This palette retails for $65. for that price it's a "nice to have" item, but not a must have. 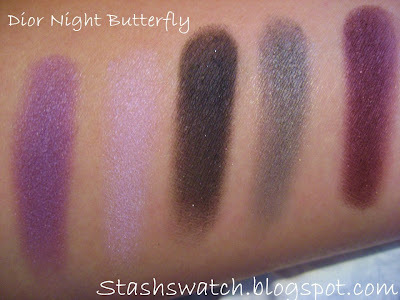 The 2nd palette I picked up was a beautiful quint of purples, Night butterfly, which retails for $56. 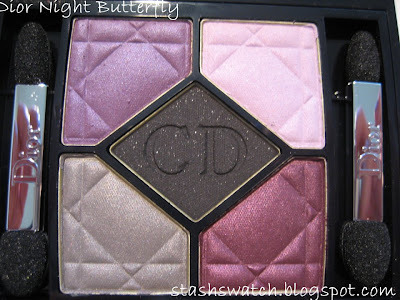 The texture of this quint differs from Dior's regular quints in the sense that it's not super buttery, however, all of the colors in the quint (except the black maybe) still apply smoothly and blend just fine. 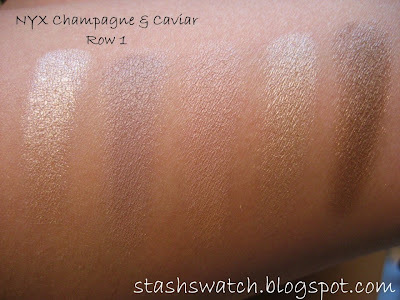 It's also much less shimmery than Dior's permanent quints, which I really like. The black color was chalky to the touch, but I'm not sure I'll ever use it since I tend to ignore blacks in palettes) The colors in the quint are a beautiful cool toned purple with blue shimmer, a pinky lilac color, black with silver glitter, a mid toned grey, and a red based plum. 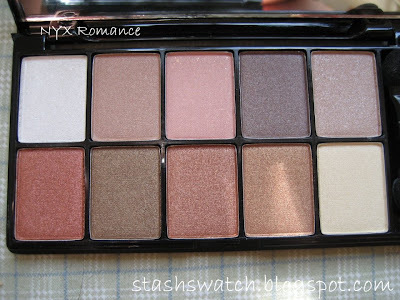 Put together, I can create a really nice purple smokey eye with this palette. Out of these two palettes I think I am definitely more drawn to the colors in this palette, although I don't think that the colors in the palette are wholly unique. Because of this, I'd also say that this is nice to have, but definitely not a must have item. For those of you who frequent the boards on MUA, you might already know that I am definitely a high end hoor,when it comes to my makeup (It's a good thing this obsession doesn't extend to my clothing and accessories or I'd really be in trouble) However, one of the few drug store or low end brands I'll use is NYX. They're a great affordable brand with products that in my opinion, competes beautifully with every mid end and high end brand out there. If you hang out on the boards, you'd also know that I'm a huge palette hoor. Unluckily (or Luckily, however you like to look at it) for me, NYX recently came out with 20 new palettes (which contain either 5 colors or 10 colors) I missed the big blowout sale NYX had of these when they first released these, and had subsequently decided to pass on them, but when nonpareilboutique had their sale over the 4th of July weekend, I caved and picked the 6 palettes I wanted the most out of the lot, and I was absolutely delighted to receive them in the mail. The quality of each palette is excellent and all of the colors in these palettes have decent pigmentation and blendability. There are a few colors that are a bit chalky (mostly the black or near black colors..which I hardly ever use so it's perfectly fine), but for the most part I love these palettes and have absolutely no regret in ordering them. I ordered 5 of the 10 color palettes; Mysterious Brown Eyes, Versus, Romance, Smokey Eyes, and Champagne and Caviar, and one of the 5 color palettes; I Dream of Barbados. 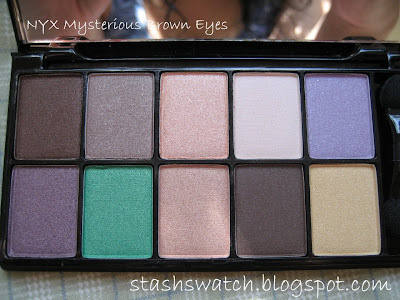 Mysterious Brown eyes is NYX's palette designed to complement, you guessed it, brown eyes. It is a mostly neutral colored palettes with a couple of purples and a green in it. Out of the 6 palettes I ordered, this is the only one I've tried on my face so far (I just started working for real and the 8.5 hour day plus 2 hour total commute has left me too wiped to play, and it takes too much effort in the morning to drag myself out of bed in the morning to leave myself time to properly apply eye makeup) Most of the colors in this palette are quite smooth, but the lilac color on the top right does feel a bit chalky. 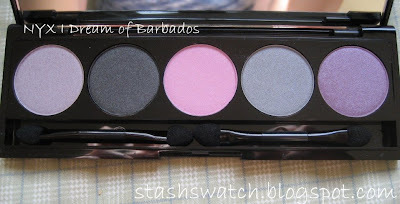 However, with a MAC 139, this color applies rather pigmented and blends just fine with the other colors in the palette. 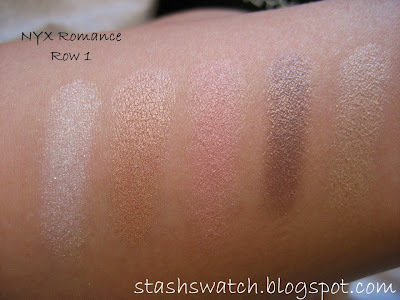 After I swateched the Versus palette, I thankfully decided to give up trying to swatch all 10 shades in a palette at once on my arm. 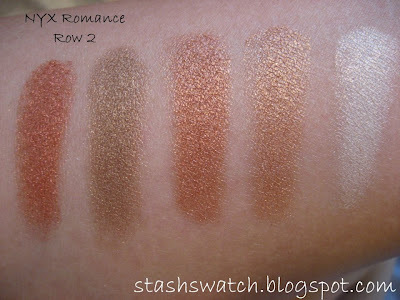 Romance is a nice warm, somewhat neutrally palette. The texture of this palette is absolutely wonderful, and I'd probably go as far to say that it is the most buttery palette in the lot of 10 color palettes I ordered. 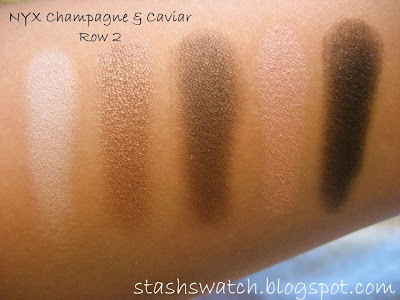 The second Row in particular is very buttery and pigmented. 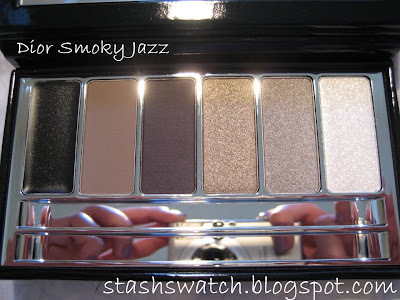 The Smokey Eyes palette is probably the sexiest smokey eye palette I've seen around. 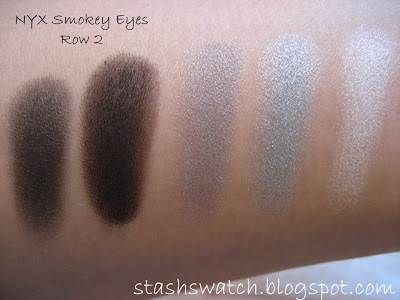 It gives a nice variety of colors to use for a classic smokey eye, which is nice, because I think that 4 color smokey eye palettes, while nice, get a little boring. This palette gives you a nice chance to play with several shades of colors to create both a warm and cool toned smokey eye. The quality of this one is generally excellent, but the first color from the left on the bottom row is chalky (It's the black color though, so who cares really). IT'd apply just fine as a liner though I think. 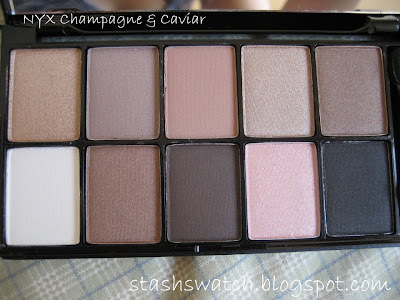 Probably the sexiest palette to look at is Champagne and Caviar. Champagne and Caviar is a great palette of neutral colors. Additionally, the colors in this palette are not super shimmery, so this palette is perfect for work. The texture leaves me with nothing to complain about either. Anyways, for those of you wondering why the title of this entry was "Part 1", I actually intend to order the rest of the NYX palettes and swatch every last one of them for you guys, so please look forward to that. Additionally, I'd like to say that I'm not quite done posting all my Stila stuff (or Bobbi Brown for that matter) , so look forward to that. If I don't update my blog for a while, there's still a decent chance that I may still be swatching. 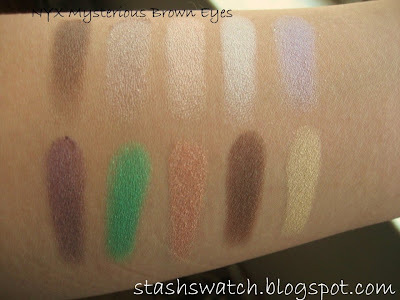 For those who want to browse some of the swatched I may have but have not posted on here, you can go ahead and check out the photos of the MUA user 'stashswatch'. That's the username I'll be using to share my swatches on the boards. Additionally, I haul in a rather OCD manner. If you see any of my haul posts (usually under my main handle 'eternalstarangel' aka ESA) and decide that you'd like to see something swatched, feel free and shoot me a message. Thanks for stopping in and have a nice day!